The last couple of years has seen the rise of good burger joints. The surprising thing is it has took so long for people and restaurateurs to realise that people want good quality burgers with proper meat than the bland we've grown used to from either fast food or pub chains like Weatherspoon. And we are willing to pay for it. We in the South East are blessed as fine burger joints in the form of Meat Liquor, Lucky Chip, Patty & Bun, Mother Flipper, Honest Burger and many others open shop around London serving their own style of awesome burger. You will never have a bad burger at either joints but they are all different enough to have their own band of burger fans. Just don't ask me which is my favourite as I love them all equally (okay, some more than others but hush now!). Last week saw the opening of two new burger joints in London. Both are established American chains operating on the upper end of the fast food burger market. Will these two big name burger chains be enough to take on London's burgeoning indie burger scene? First up, Five Guys. With over a thousand restaurants and a thousand more in development, they are the fastest growing fast food chain in the US. Their new restaurant in Long Acre (on the site of the former The Long Acre bar) is their UK's first and no doubt more shops will follow if it proves to be a success. 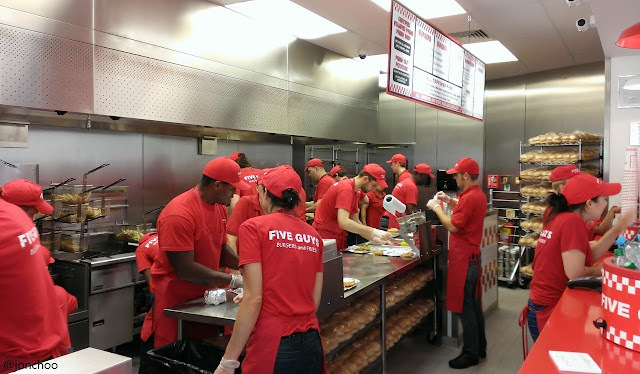 Five guys operates much like a proper fast food chain. You enter, you order, you grab your burger, you find a seat. It is pretty simple. The menu is simple too. You get a hamburger, cheeseburger. bacon burger and bacon cheeseburger, all of which are available in little single patty versions. Then there's french fries. Seriously, go for the little fries to share among two. The regular is big enough for a small family and the large for a family of classroom of twenty kids. They also do hot dogs and sandwiches, but really, what we really want to talk about are the burgers. Patties are fried well done and you can choose as many toppings as you want. My favourite is the cheeseburger with jalapeno peppers (I just found out this is also Obama's but whatever). The buns are a tad soggy, but still appropriately deliciously and oily. At least they don't break easily which is an attribute you would want in a burger bun. We can't talk about Five Guys without talking about their soda machine. 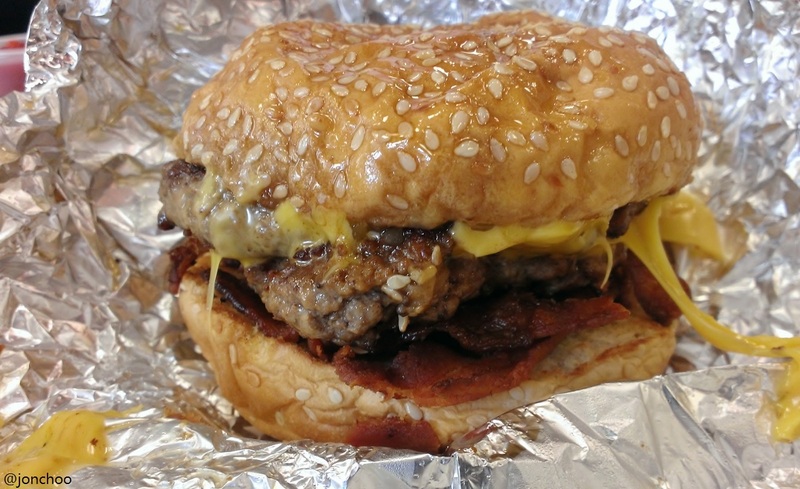 Oh boy if you love sweet fattening cola, you will love Five Guys. The touchscreen operated machine allows you to choose from over 120 Cola Cola products, varieties and flavours. Want to big up your kid to be a sumo wrestler, introduce them to the soda machine. Overall I think Five Guys serves a pretty good burger, and the ability to customise your burger is a huge plus (do the jalapeno peppers). They don't do shakes or cocktails but they do serve pissy Budweiser and some standard craft beers. But I doubt I would go all the way to return to Five Guys. The reason is the same as I will give at the end of this blog. Next up is Shake Shack down in tourist heavy Covent Garden market. Like many independent burger joints, Shake Shack started out as a food truck, this one in Madison Square Park in New York City. As their name implies, they serves shakes. 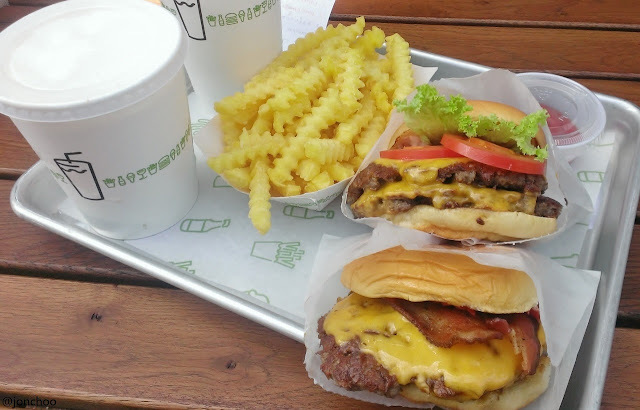 Sure sure they do beers and sodas as well, but you don't go to Shake Shack for those, you go for the shakes. And ice cream concretes. Oh, and the burgers. The menu here is even simpler than Five Guys, with no choice of customising your burger. We had a double ShackBurger, which comes with two well done patties, cheese topped with lettuce, tomato and ShackSauce; and a single SmokeShack, a cheeseburger topped with applewood smoke bacon, cherry pepper and ShackSauce. Both burgers were delicious, but I found the ShackBurger forgettable. The SmokeShack fared better thanks to the cherry pepper which goes well. The buns weren't soggy and held on the entire time. For vegetarians, you will be happy to know that Shake Shack serves rabbit burgers in the form of a crispy fried portobello mushroom. All in all, we enjoyed Shake Shack. The staffs were friendly, the shakes and root beer float were incredible and the burgers are still good. If Shake Shack came to the UK two years ago there is no doubt that Shake Shack and Five Guys would have been my favourite burger joints, but I believe that the London indie burger scene has caught up with and in many ways, surpassed, their American counterparts. Still, having Five Guys and Shake Shack opening here isn't a bad thing especially when they have the resources to expand further outside London. Where we live in Hertfordshire, we have no burger joints to choose from, so a Five Guys restaurant in St Albans will be very much welcome. Oh wait, we are moving. I prefer having crispy bacon but since they tend to end up dry... Flabby will do. But look at that gorgeous, greasy, meaty, pile of awesome! Why am I not living in a place with burger joints like these?